Italy’s Prime Minister is promising that the homes, churches and properties destroyed in a string of earthquakes over the past two months will be rebuilt. Matteo Renzi made the pledge just hours after another powerful quake hit the centre of the country. Italy is living through difficult times, Renzi added, but he promised a massive reconstruction effort in the years ahead, regardless of any possible objections from the EU over the eventual costs. Pope Francis said he was praying for the victims of Italy’s latest earthquake. Speaking at his weekly Angelus prayer at the Vatican, the pontiff expressed his solidarity with the quake-hit communities. “I express my closeness to the population of central Italy hit by the earthquake,” Francis said. Both spoke in the wake of a 6.6 magnitude tremor that struck Italy on Sunday morning. It hit the same central regions that have been rocked by repeated tremors since August 24. Emergency services reported widespread damage in the latest earthquake, but no initial deaths. “No deaths have been reported, but there are a number of people injured,” said Civil Protection chief Fabrizio Curcio. He added that one person is in a serious condition. Experts say it is the strongest tremor since a 6.9 quake in southern Italy in 1980, in which 2,735 people were killed. Panicked residents ran onto the streets of the historic Umbrian walled town of Norcia, 100 km from Perugia and near the epicentre of the ‘quake. The town’s ancient Basilica of St.Benedict collapsed, leaving only its facade standing. Nuns, monks and locals sank to their knees in the main square in silent prayer before the shattered church. “This is a tragedy, it is a coup de grace. The basilica is devastated,” said Bishop Renato Boccardo. The frescoed basilica, which is the spiritual, historic and tourist heart of Norcia, was built over the site of the home where the founder of the Benedictine order and his sister St. Scolastica were born in 480. The basilica and monastery complex dates to the 13th century. Shrines to St Benedict and his sister have been built there since the 8th century. Benedict founded the Benedictine order in Subiaco, near Rome. He died in 530 in the monastery at Monte Cassino, south of Rome, which was destroyed during the Second World War but later rebuilt. 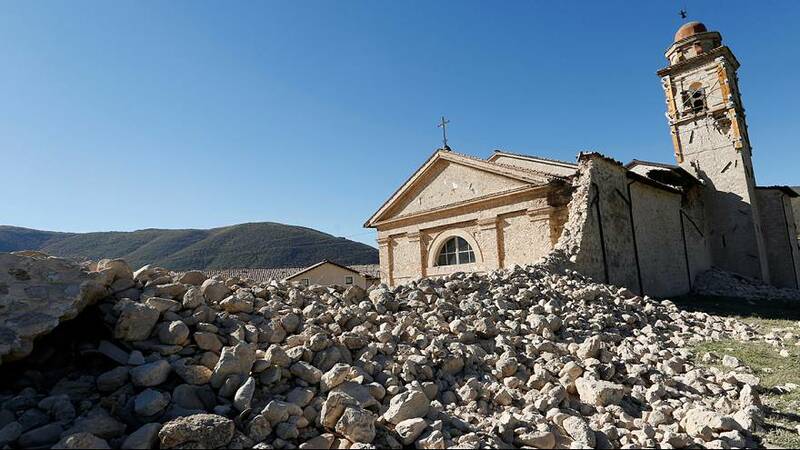 Nuns who had been living in a cloistered community were helped to safety in the walled Umbrian town of Norcia on Sunday, following a 6.6 magnitude earthquake. The sisters, who normally have no contact with the outside world, were seen scurrying down rubble-strewn streets before being guided to safety by firefighters. One was carried to safety along the road. Italy’s Civil Protection Unit, which coordinates disaster relief, says numerous houses were destroyed in the regions of Umbria and Le Marche. The majority were deserted at the time, or the residents managed to escape. Coffins peeked out of tombs in a cemetery near the town of Visso. The latest quake was felt across much of Italy. It struck at 0740 am and its epicentre was close to Norcia, around 100 km from the city of Perugia. Italy sits on two geological fault lines. This makes it one of the most seismically-active countries in Europe. Gianluca Valinsese, a scientist at Italy’s National Institute for Geophysics and Vulcanology, has warned the latest series of quakes could continue for weeks in a domino-effect along the central Apennine fault system.